Glad to be a Girl: Feel it, it is here. 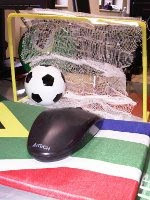 So today is the day, the first game of the Soccer World Cup in South Africa. The place is crazy with excitement. I'm not wildly into the whole soccer thing, but the generally happiness of the people, I'm enjoying that. Am looking forward to heading to a local pub a bit later with the work crowd where we've booked a table for 20 to watch together. See, that's the bit of sports I like. The getting together and watching as a crowd and the vibe. I would never in a million billion years be the sort of person who sits at home on their couch watching sport (if I even had a TV), but I'll definitely go along with a group to watch in a pub or to a live game. (Although I'm not going to any of the soccer games - soccer interests me not a jot ... I was kinda keen to go to one just for the vibe and experience tho, but we didn't end up getting tickets). The highlight of yesterday tho, was pranking @jarredcinman ... who the office has taken to calling the Grinch of the Soccer World Cup. 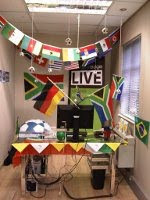 He was in Durbs on Wedneday for business and we took the opportunity to "gees" up his corner of the office. It was truly excellent :) My 3 favourite bits were the spare keyboard we made for him, sticking pentagons on his exercise ball-chair and hanging mini-soccer balls from his ceiling! How did Jarred take the pranking? Haha, he actually thought our effort was brilliant :) and he hasn't even taken it down yet ... although he did get his proper keyboard back, remove the paper from his exercise ball-chair and a few of the soccer balls have fallen down. AWESOME keyboard and office gees. Very ayoba.